Given the option to spend a semester abroad in Madrid, I decided to go for the entire year, not realizing just how far I would be from everything and everyone. The family I had been assigned to live with at random didn’t help. From the first day, they made me feel like an wandering hobo or stranded motorist who’d washed up to their grim house to use the phone (except I wasn’t actually allowed to use the phone). For the next two months, I had a terrible case of homesickness. The city I’d dreamed of seemed completely closed to me. Family in Spain and a few friends got me through, but it wasn’t until I broke up my year with a trip home for Christmas and arranged for new housing that the spell finally broke. Mostly because of Aurora.Plump and owllike, Aurora was a cross between a fairy Godmother and Spanish matron. Constantly doing things for her children, grandchild and students she was housing, she’d spend all day in and out of her airy kitchen with sky high windows. The next few months, I made more friends, traveled, and found my way through the city that slowly opened itself up. 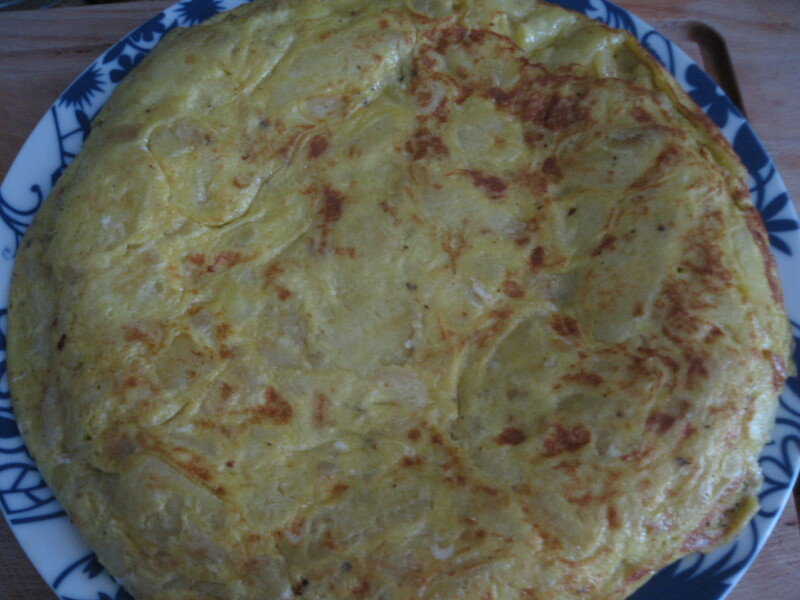 When my year was over, Aurora sent me home with a silver filigree locket in the shape of a tear drop, a tea towel with the ingredients for sangria printed on it and her recipe for tortilla de patatas (known as tortilla española everywhere else). Realizing I would need to learn from her so I could make it on my own later, it’s the first recipe I’d ever asked for. A blend of olive oil fried potatoes and onions mixed into well beaten eggs, I’ve made it often since that last afternoon in Madrid when she showed me how and every time it is pure comfort. Heat the oil in medium-sized heavy skillet over medium heat for 3-4 minutes. Beat the eggs with the salt in a separate bowl and set aside. Add the potatoes and onions to the skillet and turn constantly with a spatula, careful not to brown. Saute until just tender and they break with slight pressure from the spatula breaking the larger pieces in half, about 12-15 minutes. 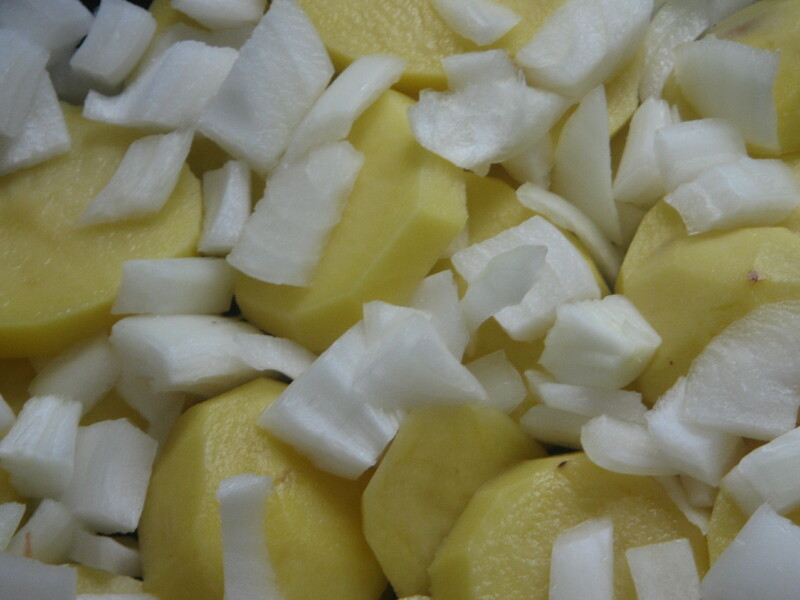 Remove potatoes and onions with a slotted spoon and add to egg mixture. Adjust salt to taste. Pour out all but about 1 tablespoon of oil and set aside. 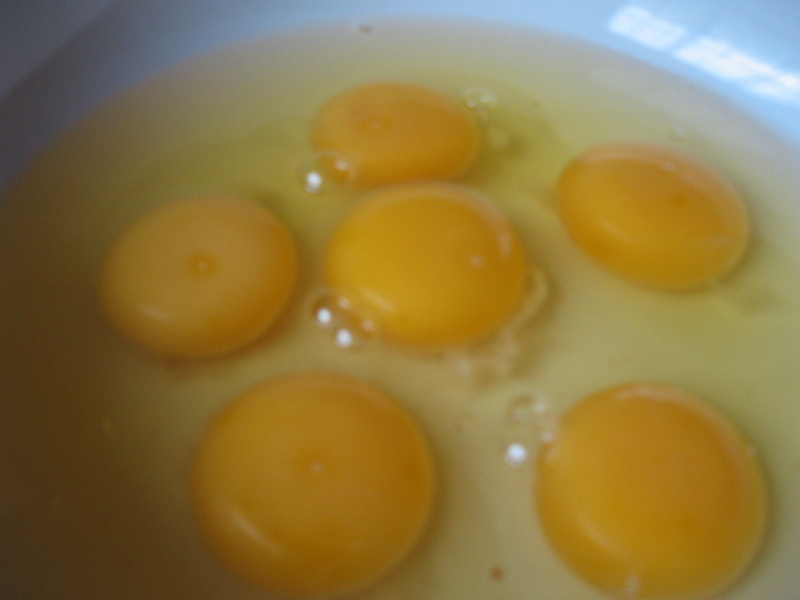 Return mixture to skillet and cook over medium until eggs begin to set and underside is lightly browned. Take skillet off burner and place and cover with large plate. Holding plate down firmly, quickly turn over the skillet so that the omelette slides out onto the plate. * Return skillet to medium heat and add additional oil if needed. Slide omelette back into the skillet and cook on the other side an additional 4-5 minutes till it reaches desired degree of doneness. Flip omelette one more time onto serving plate. Serve at room temperature either in sliced into wedges or cut into squares. 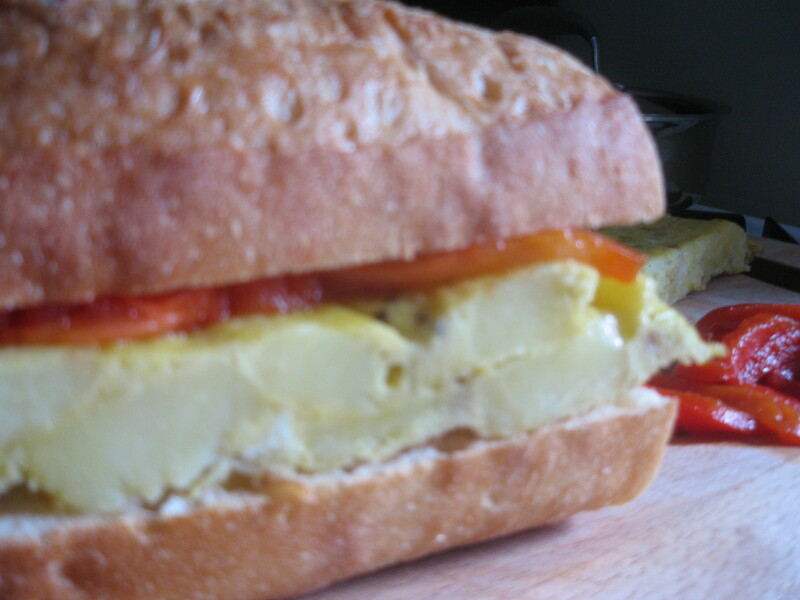 For picnics, it’s also great to have with a few roasted peppers and a baguette as an egg salad alternative (that’s much less messier). *The omelette is heavy so the flip can be tricky. I always flip it over a sink, and I’m superstitous about being alone since the only one I’ve ever lost was when I was chatting and flipping at the same time.